Our 7 day weather forecast for Victoria updated throughout the day, making it ideal for planning leisure activities, travel and events. Read more about our weather forecasts. On Saturday 20th April 2019 the sun will rise at 07:14 and will set at 21:12. It will be a mild day, with temperatures reaching around 15.3°C. Today is expected to be a dry day, with a very low chance of rain. It will be a very clam day today, with a maximum expected wind speed of 11mph. On Sunday 21st April 2019 the sun will rise at 07:12 and will set at 21:13. It will be a mild day, with temperatures reaching around 14°C. Today is expected to be a dry day, with a very low chance of rain. There will be a gentle breeze in the air today, with a maximum expected wind speed of 14mph. On Monday 22nd April 2019 the sun will rise at 07:10 and will set at 21:15. It will be a mild day, with temperatures reaching around 11.4°C. Today is expected to be a dry day, with a very low chance of rain. It will be a very clam day today, with a maximum expected wind speed of 7mph. On Tuesday 23rd April 2019 the sun will rise at 07:08 and will set at 21:16. It will be a mild day, with temperatures reaching around 15°C. Today is expected to be a dry day, with a very low chance of rain. It will be quite a breezy day, with a maximum expected wind speed of 23mph. On Wednesday 24th April 2019 the sun will rise at 07:07 and will set at 21:18. It will be a mild day, with temperatures reaching around 15.1°C. Today is expected to be a dry day, with a very low chance of rain. There will be a gentle breeze in the air today, with a maximum expected wind speed of 15mph. On Thursday 25th April 2019 the sun will rise at 07:05 and will set at 21:19. It will be a mild day, with temperatures reaching around 18.2°C. Today is expected to be a dry day, with a very low chance of rain. It will be a very clam day today, with a maximum expected wind speed of 10mph. On Friday 26th April 2019 the sun will rise at 07:03 and will set at 21:21. It will be a mild day, with temperatures reaching around 11.2°C. A few showers are expected, 3mm of rainfall is possible today. It could be quite a gusty day today, with a maximum expected wind speed of 23mph. Our weather forecast for Victoria is updated throughout the day and has been found to be very reliable for planning activities such as days out, leisure, travel, events, fishing, golf and gardening. 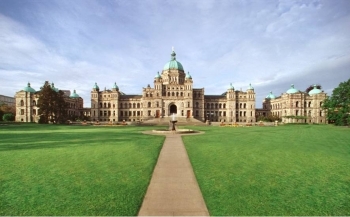 Overlooking Victoria's majestic Inner Harbour, the Parliament Buildings are open to the public year-round. Visitors are invited to discover the architectural splendour of the Parliament Buildings and learn about British Columbia's Legislative Assembly. The Parliament Buildings are open to the public from Monday to Friday between the hours of 8:30 am to 5:00 pm. Visitors are welcome to join one of the regularly-scheduled guided tours or to explore the buildings on their own self-guided tour (available in various languages). During the busy summer season, the Parliament Buildings are open for tours seven days a week, including statutory holidays. Guided tours are free and last approximately 30 to 45 minutes. Tours are offered frequently throughout the day, but the schedule changes daily in order to accommodate school and group bookings. Please contact the Tour Office or visit our website closer to the date of your visit for up-to-date schedule information. Tours in other languages or for groups of 10 or more people must be booked in advance. The Parliamentary Gift Shop featuring unique items and the Parliamentary Dining Room are open to the public year round.